Taking its name from David Hockney’s 1967 painting entitled A Bigger Splash, Tate’s exhibition focuses on the relationship between performance art and painting, specifically the infusion of the two. It gathers together works of varying mediums, including photographs, films and installations, from the 1950s to the present day. I went to this exhibition back in December, straight after seeing the Tate’s double photographic exhibition on William Klein and Daido Moriyama. I entered the first room slightly bemused. I came out of the last room without much difference. A Bigger Splash, 1967. Image via www.wearecollision.co.uk. Upon entering the first room, one could easily tell they hadn’t given much thought about first impressions and really giving that ‘splash’ to excite the viewers. To the left of the entrance was Jackson Pollock’s Summertime: Number 9A 1948, enclosed in a glass display case, laid flat on a raised, white platform, just like how Pollock would have originally laid it during painting. Suspended on the wall next to it was a film showing Pollock making his Abstract Expressionist paintings. 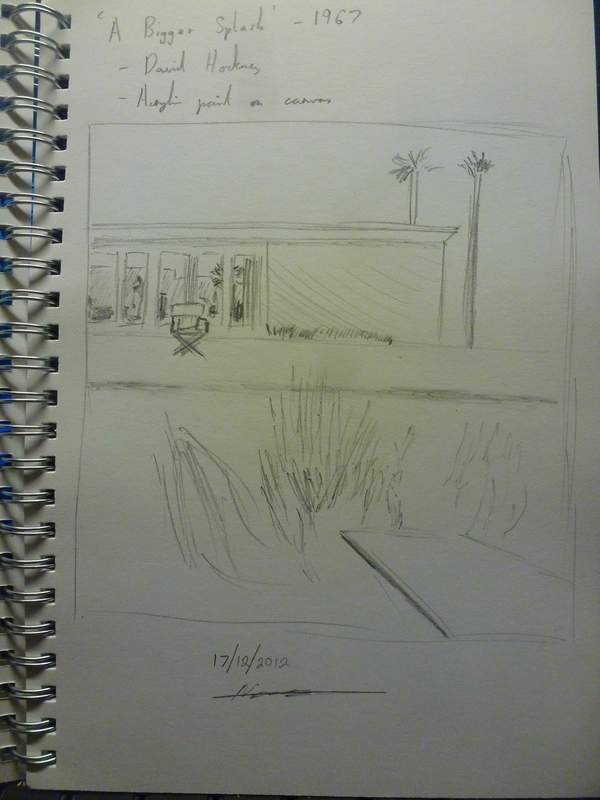 On the wall opposite hung Hockney’s A Bigger Splash 1967, with a short film based on it displayed on a screen nearby. These works barely filled the room. The next room was slightly better, being smaller, and more works were displayed within, including Yves Klein’s IKB 79 1959, which I had never seen before and had only heard of it for the first time during my contemporary art module at university. There were film clips of Kazuo Shiraga swinging from a rope while painting with his feet, Niki de Saint Phalle’s canvas created by shooting paint at it, Shozo Shimando’s destructive and creative art-making, and Pinot Gallizio’s mass-produced rolls of paintings. The next 3 rooms pretty much consisted of a mass selection of performance-painting works, featuring artists like Günter Brus, Ana Mendieta, Yayoi Kusama, and even Cindy Sherman. 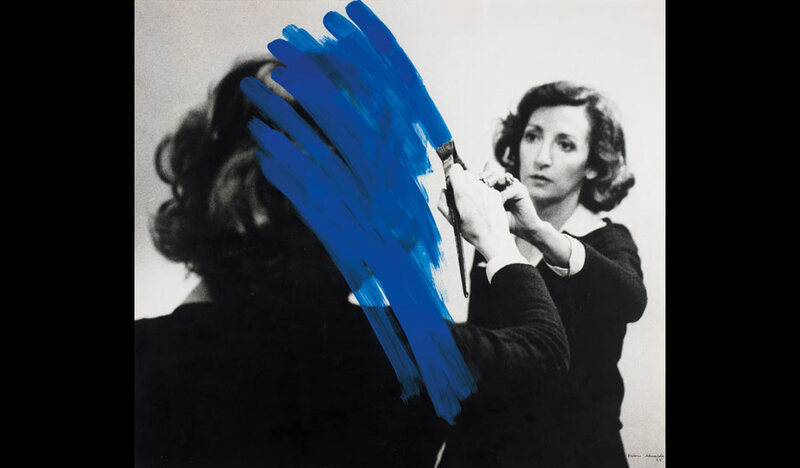 I did, however, manage to find someone I like, a certain Helena Almeida, whose Pintura Habitada (Inhabited Painting) series of 1975 shows theatrical self-portraits of her with a stroke of a blue paint physically painted onto each of the images. A rare Self-Portrait in Drag 1981 by Andy Warhol was also on display in the same room. Helena Almeida, Pintura Habitada (Inhabited Painting) 1975. Image via www.guardian.co.uk. Installations filled the next 3 rooms, starting with Edward Krasinki’s illusionary use of blue tape and mirrors and ending with Karen Kilimnik’s theatrical Swan Lake 1992. Between them is also an attempted reconstruction of a French room by Marc Camille Chaimowicz. The last few rooms of the exhibition focused more purely and separately with painting and performance works. To me, they seemed a bit too randomly placed, as if they failed to fit any sort of theme or appropriate layout for the exhibition. I rather enjoyed the very last room of the exhibition, dedicated solely to the illusionary works of Lucy Mckenzie and her trompe l’oeil technique. Unfortunately, the room was a bit too large for the works, making them seem too spaced out and partially ruined the illusion. Tate’s attempt at creating a thoroughly engaging showcase of performance artists’ works seemed more like an overwhelming dose of names and overly-long informative plaques. The individual sections of the exhibition weren’t exactly tailored to any specific themes; at least they certainly didn’t feel like it. The presentation of the displays was rather indifferent to that of the Tate Modern’s permanent collection. In fact, I could even argue that the presentation of the permanent collections seemed more exhibition-like than that of the exhibition. However, I will admit that there is a saving grace that prevents this exhibition from being entirely tragic. It gives us a sense of the popularity of performance art, giving rise to notable figures like Marina Abramović. It is a genre that, due to its expressive qualities, has deemed it worthy of being considered ‘art’, even though the outcomes aren’t always to our liking. However, the performance aspect of this genre is worth considering since it is a very diverse aspect, one that redefines the barriers of what art actually is. Overall, it’s an exhibition that is vulnerable to mixed responses, appealing to different peoples’ tastes in art. It can be a great source of information for those who have little knowledge of performance art, but it can also be confusing to understand the key themes of the exhibition, whether such distinctions can be made or not. I wouldn’t exactly say it’s a particularly appealing event, at least not for me, but more like one of those things that invoke a bit of curiosity in us. All in all, if you want to check it out, just don’t expect too much. 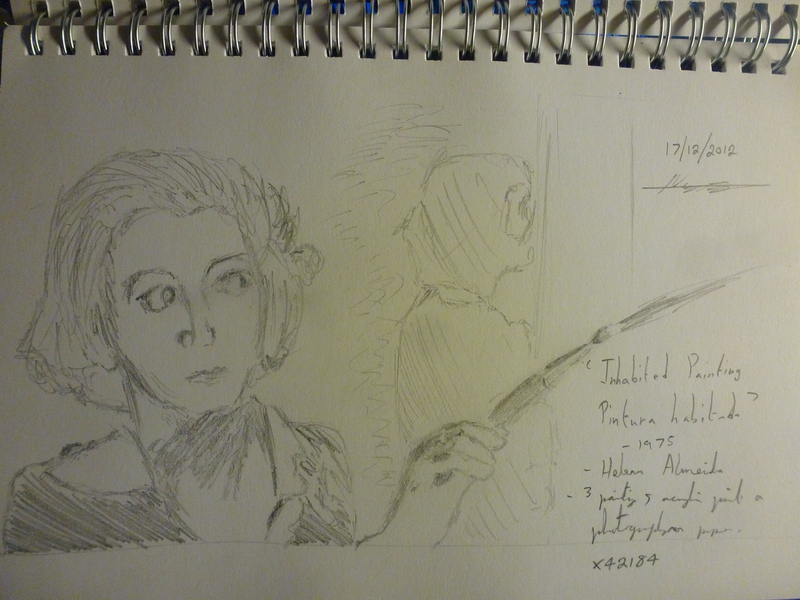 My exhibition sketches. Own photographs. 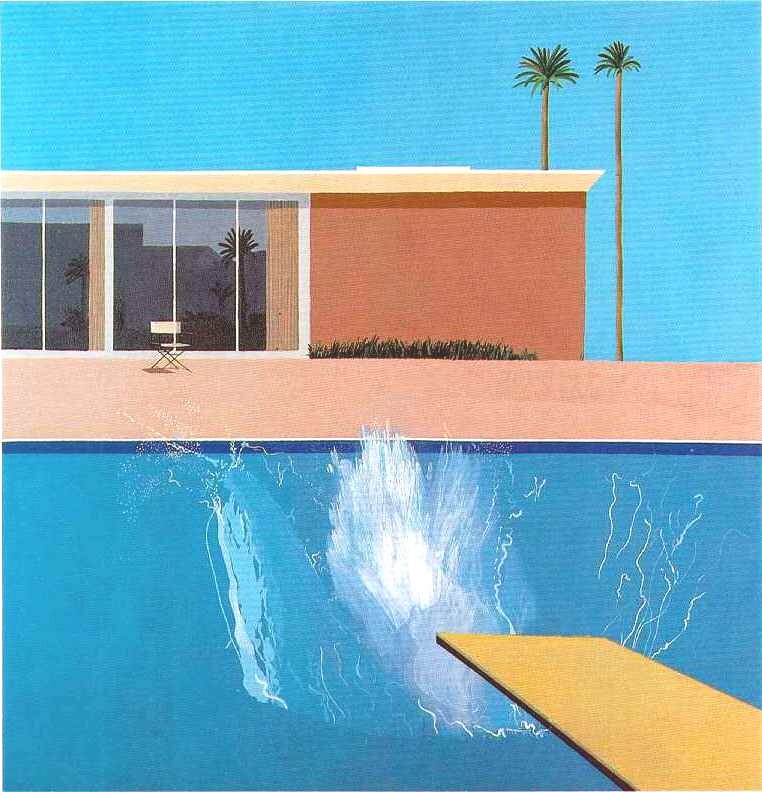 A Bigger Splash: Painting after Performance runs until 1st April 2013 at Tate Modern, London, www.tate.org.uk.